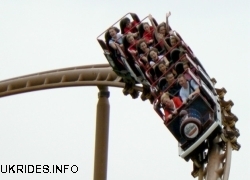 Pleasureland Southport is understood to be targeting the Knightmare rollercoaster as an addition to the amusement park. Standing unused at the Camelot theme park since that’s attraction’s closure in 2013, the Schwarzkopf-manufactured ride has been up for sale. Pleasureland owner Norman Wallis was photographed by the Southport Visiter with a model of the ride. The newspaper reported that he suggested he could build a “landmark rollercoaster along the seafront”. Speaking of his wider ambitions for the resort, Wallis said: “Southport has not lost it yet but it has to sort it out now. “We have a window of opportunity here and if people haven’t got the foresight to see that and let me get on with it, the town will suffer.